The theme of the fourth lecture of advanced course is about "reference points". Among many characteristics of Shakuju therapy, this idea of reference points is simply special, I think, compared to other therapies. Even for other therapeutic methodologies that do not contain the concept of deficiency of Jin-qi, this idea would be beneficial. But, writing about reference points generally would be boring, so I would like to describe it in relation to consciousness that I mentioned in the last article. Touching reference points are actually the most essential thing to use consciousness. Most of us do this unconsciously. In other words, those who do not touch reference points firmly never be able to use consciousness. Some people might think about something like non-inquiry-examination, the condition that a practitioner comprehend the state of the patient's body without touching. Here, it is no problem when acquiring the patient's information (four examinations), however, it has only demerits when the practitioner wants to change the patient's body (treatment). When one can get used to consciousness, he/she is able to send something like so-called qi. However, it is very difficult for those who have not been used to touching patients and checking reference points carefully. That is, using consciousness, in terms of checking reference points, is (1) able to let the consciousness of the patient be aware with the exact points = touching leads to treatment and (2) able to let the practitioner to project his/her consciousness. Once one is able to check reference points firmly, it also let the consciousness of the patient be at the exact reference point, and the practitioner feels easier to project his/her consciousness, so the treatment effect increases massively. (2) The projection of consciousness here means grasping the patient's reference points carefully in terms of anatomical comprehension, and also touching the same reference points many times with reproducibility. Then, when the practitioner who acquire such a skill is able to send qi (?) there, the treatment effect can be doubled more! I'm emphasizing this so many times, but you have to acquire the visible skills to be able to acquire invisible skills. 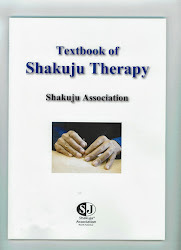 In the process of learning Shakuju therapy, the numbers of reference points is increased more and more. You have to be able to choose, touch and get information from such reference points, depending on each state of the patient, to use the consciousness freely. Kobayashi sensei sometimes introduces new reference points that he discovers in certain occasions, such as two days seminar. When the new point that I haven't touched yet is added, I also am a beginner for checking the new reference point, so I try to make an effort to touch it. I touch the point of every patient surely, even if it is unnecessary for some patients. Then, I can get used to the reference point, so I can use it without problems when the actual patient who needs to be checked it comes. The issue is not whether you know or not, but whether you are able to do or not. Namely, it is whether you have been practicing or not. Checking reference points during a treatment, this is the essential thing in Shakuju therapy, but it is the shortcut to use consciousness. * (1) and (2) in the articles are what Kobayashi sensei wrote in the lecture.